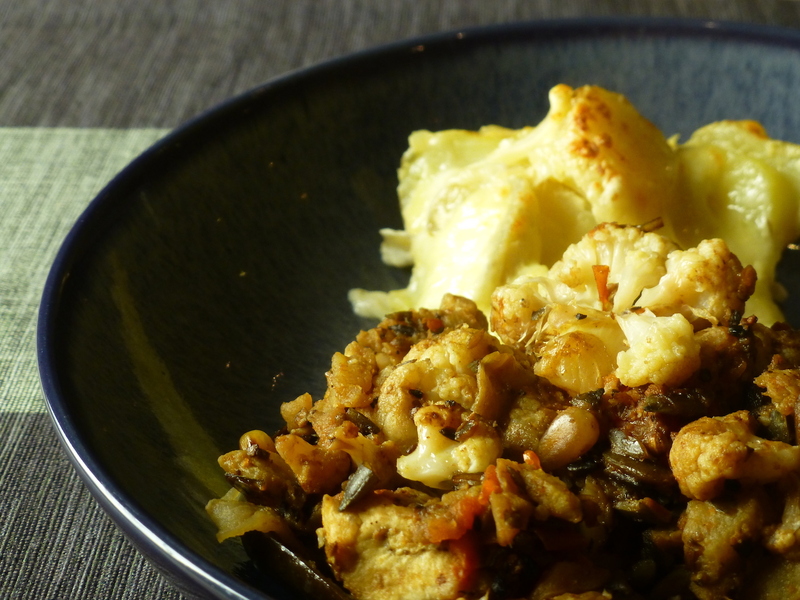 Aubergines stuffed with stir-fried cauliflower and potato gratin • Quick & Tasty - Get Cooking! This is my second festive recipe for Quick and Tasty: aubergines stuffed with stir-fried cauliflower, served with potato gratin. Cut the cauliflower into small florets and cook for 4 minutes in the microwave at full power (900 W). Cut the aubergine lengthwise into two and scoop out the flesh and set aside. Cook the shells for 4 minutes in the microwave at full power (900 W). If you want to save time, start cooking the potatoes for the gratin now. Chop the tomato into very small pieces. Heat the oil and fry the ginger, spices and ground pumpkin seeds for a few minutes. Add the pine kernels and cauliflower and stir-fry over high heat until the cauliflower starts to brown. Add the soy sauce, tomato, aubergine flesh, sugar and lemon juice and stir-fry over medium heat until the tomato becomes soft and the aubergine flesh is done. Let it simmer for a few minutes more on low heat. Stuff the aubergine shells with the mixture and cook for 2 minutes in the microwave at full power (900 W). Cook the potatoes for 10 minutes in the microwave at full power (900 W). Cut the potatoes into thin slices and arrange them in an oven tray. Mix the cream with the Philadelphia cheese and two tablespoons of the porcini mushroom soaking liquid and heat in the microwave for a minute at full power (900 W). Stir and check if it is liquid enough to pour, otherwise heat a bit longer. Add a teaspoon of garlic oil and the porcini mushrooms and pour the mixture over the potatoes. Bake the pototoes for 2 minutes in the microwave at full power (900 W). Add the grated cheese on top and grill for 4 minutes.